Simon is about to retire from the extermination business and is on his way to his last job. When he is overcome with sickness enroute he decides to spend the night in the Spa town of Val les Bains. There he meets a young man, a very pragmatic soul, Bernard, who is looking after his mother whilst he recuperates from losing two fingers at work. Simon is feeling unwell and hires Bernard to chauffeur him to the Mediterranean town of Cap d'Agde so he can fulfil his last commission. How's the Pain? is a short and at times amusing novel about Simon and Bernard's adventure and how things don't go to plan; the people they meet on their journey; the people left behind in Val les Bains; Simon's long career and life in France today. 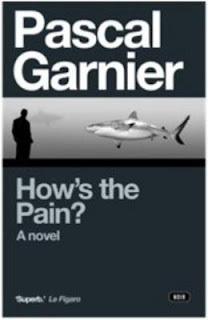 In the notes from translator Emily Boyce, she writes that ”some...label his [Pascal Garnier's] genre the roman gris, with touches of brightness lightening the grim outlook of noir”. I enjoyed this book, as I have the two similarly brief novels by the slightly more noir Jean-Patrick Manchette: The Prone Gunman and Three to Kill.